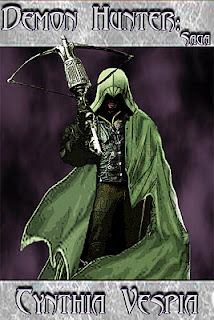 Enter to win and eBook copy of Demon Hunter: Saga. Have you ever re-invented yourself? They say you can change who you are every second of the day. For me it has happened roughly three times prior (and I have the tattoos marking those transitions in my life permanently). Change is good even though most of us are uncomfortable with it. At the close of 2011 I re-invented myself once more. The focus on my writing has doubled with an effort to really harness the reigns of my career and drive it towards the projects that I feel passionately about. It will be a busy year as my graphic design and video editing services become more “author friendly.” I am knee deep in edits for my thriller set in the seedy underbelly of my hometown of Las Vegas; and the crown jewel of all of it began with the re-release of the Demon Hunter Series. My dark fantasy trilogy came out in 2009 as an e-book and was originally met was some splendid reviews. The start of 2012 saw the re-birth of Demon Hunter in print editions as well as standard e-book format for Kindle, Nook, etc. Along with the first two in the series, The Chosen One and Seek and Destroy, the series concluded with the never before released third installment titled Heroes Call. I'm proud to say that Demon Hunter is some of my finest work. What I enjoyed most about writing it was the POV or the viewpoint I took to tell the stories. Originally I started with a third-person perspective but halfway through I knew something wasn't working. When I switched to first-person everything clicked and the story flowed seamlessly. When I recently began writing my latest thriller I opted to take that same route. This time I threw out all my standard rules. I gave up the outline, the character breakdown, everything. I'd heard author Dean Koontz describe this as his writing style and I wanted to give it a try. Surprisingly I've not only put out a great deal of work from this process but it also re-ignited my creativity. I have had more fun writing this particular novel than I have had in a long while. I've always approached my writing, or any new task really, with the thought of learning the rules and then adapting what works for me. Sometimes you might even need to throw out the rules completely. That's the beauty of fiction. Whether you're writing or reading it you can suspend your disbelief and leave the structure of reality for a little while. So how do you know what voice to lend to a particular story? I try not to think about it too much. Particularly now that my little experiment has worked out so well for me I am not about plotting any longer. Just the spark of an idea to lead me on my way. I let the story tell itself. It's fascinating and fun to see what happens next, as if I'm reading it for the first time myself. Some novels might be more complex than others and its at that point that I will go back through during the editing phase and flush out the sticky points. I believe now that with a fully developed world, and realistic characters, the story will find itself and come together. If it needs an extra nudge along the way or during editing so be it. My Muse and I will work overtime. Sleep is overrated anyway. This process is not so new to me, I used to go off the cuff all the time when I first started writing. Weren't we all something of little rebels when we were younger? Somewhere along the way I got bogged down in the mechanics of it all. It is very freeing to be able to return to my roots and even more freeing to take charge of my talent and my projects in a way that I always envisioned them being. Telling the story in first-person anchors me to the character a little bit more than if I used third-person. I feel a decided interest in this person as I write out their thoughts and emotions through their own eyes. Obviously if you are writing a multi-character novel first-person probably wouldn't work. Or would it? I don't know of anyone who has tried it but I can see where it would become confusing for the reader. But I'm not above experimenting. Like I said, throw out the rules...make some of your own. I'd like to know which POV do you prefer to read and/or write in? I'm comfortable with all styles (though I've never really used second-person before.) First-person is a little more intimate to me but no matter what the characters I've developed over the years have all remained with me no matter what the genre, plot, or POV. Please leave a comment or a question. Those of you who do will be entered in a drawing to win a free copy of one of my novels so remember to leave an email where we can contact you if you win. Thanks for stopping by and as always Live Your Dreams!! !